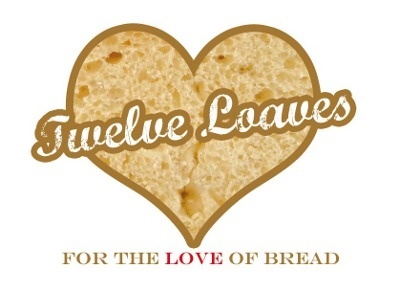 It’s all about Jewish breads this month for the Twelve-Loafers. And while I’m baking challah and light deli-style rye breads regularly, I wanted to do some research before deciding on this month’s bake. I decided to purchase the book ‘Secrets of a Jewish Baker – Authentic Jewish Rye and Other Breads’ by George Greenstein and although it’s a slightly dated book (published in 1993), it provides a great range of recipes and features many interesting anecdotes from George Greenstein’s life as well as – of course – many of his Baker’s Secrets. A more modern book (with photos!) that is focused on distinctive Ashkenazi breads and baked goods in Eastern Europe and America is ‘Inside the Jewish Bakery: Recipes and Memories from the Golden Age of Jewish Baking’ by Stanley Ginsberg and Norman Berg (published in 2011). It beautifully captures the heyday of Jewish bakeries in the United States. Having a weakness for rye baking, I decided to go for the marble rye loaf – a bread very closely associated with Jewish-American cuisine, particularly the delicatessen. It’s such a Jewish mainstay that the TV show Seinfeld created a full episode around it in “The Rye”. My aim with marble rye was to achieve an even and distinct swirl for maximum aesthetic impact when sliced. 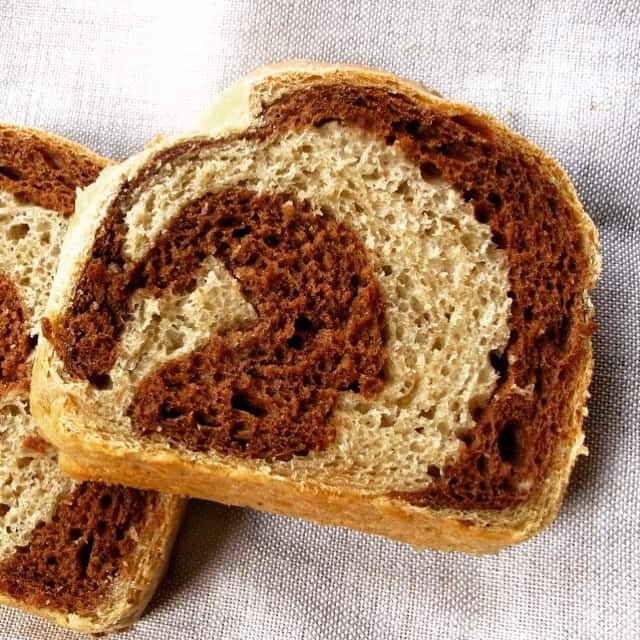 Contrary to popular belief, the dark swirl in a marbled loaf is not pumpernickel (for an authentic way of baking German pumpernickel follow this recipe). It’s the same rye dough as the light swirl, but made darker by adding a colouring agent. The dark swirl in my recipe is achieved by colouring part of the dough with cocoa powder and black treacle. The key to baking a perfectly proportioned marble rye bread is therefore to use the same base dough for both the light and dark parts. Prepare the two doughs separately. In two separate bowls, combine the light rye dough and dark rye dough ingredients – don’t add the vegetable oil at this stage. Add additional tablespoon of water to the dark dough if needed. Knead each dough for 5 minutes, adding the vegetable oil at the end, shape the dough into a boule, then place it back into the bowl and cover. The doughs should feel the same in terms of texture with the colour being the only difference. This will ensure they rise at the same speed. Leave to rest in a warm place until the dough has risen to double its original size (1 or 1.5 hours should suffice). Prepare two loaf tins and lightly oil the insides with a brush. Divide both rye doughs into four equal pieces with your dough scraper. On a lightly oiled surface, flatten the first dough part into a long rectangle with your hands or a rolling pin. Based on the baking tin you will be using, the dough rectangles should be wider than the tin but not as long as the full tin as the length will extend as you add the dough parts together. My dough pieces were roughly 23 cm long, 18 cm wide and 5 mm thick. Of course, it’s possible to bake free form, but the baking tin will make for more evenly shaped slices. Straighten the edges as needed but try to achieve an even thickness – the dough should be nice and pliable. Prepare one light and one dark dough part next to each other in order to achieve the same size and thickness. Stack one dough on top of the other and continue with this process in alternating colours – first light, then dark, then light, then dark – the bottom dough piece will form the outside of the loaf. Ensure the dough pieces stick to each other by patting the dough lightly with your hands. Form two loaves with four dough pieces each. Roll up the dough to form a loaf, keep it tight and ensure to eliminate any air pockets. Try to roll the first part quite tightly for the top dough layer not to form a huge middle shape in your swirl. Stretch and pinch the seam of the dough at the bottom of the loaf to secure the edges at the bottom of the loaf. Try and stretch the outer layer seam to connect into a full single-colour outer layer. All rolled up, place the loaves seam-side down in the baking pans and cover tightly. If needed, elongate and carefully pat the loaf to fit nicely. Rest at room temperature for the second rise until fully proofed (press the dough with your finger – if the indentation doesn’t spring back, the dough is fully proofed), about 1 to 1.5 hours. Make sure the dough is fully proofed – otherwise the top of your loaf might crack open. Preheat the oven 1/2 hour before baking. After 20 minutes, briefly take the loaf tins out of the oven to brush with egg wash for a nice shine, then bake for a further 20 minutes. Take out from the loaf tins and cool on a wire rack. Leave to cool completely and enjoy with pastrami and mustard.